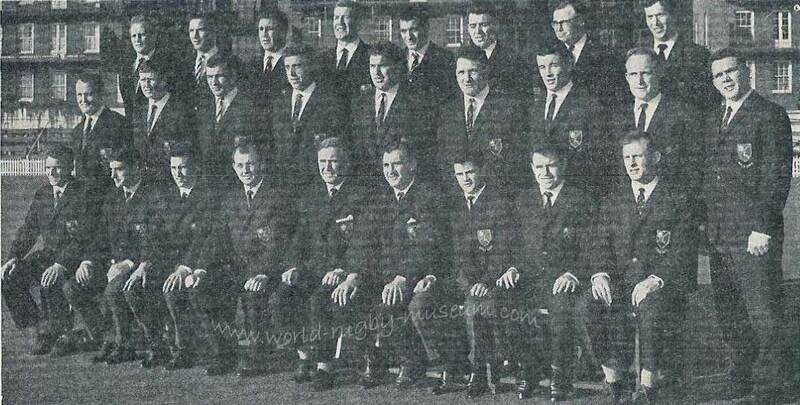 In 1964 the Welsh national team undertook their first overseas tour. The host country, South Africa were celebrating the 75th Anniversary of their union (South African Rugby Football Union. The Springboks were still unbeaten against Wales and continued this run with victory in the only test of the tour. Wales played a total of five matches, winning three and losing two. 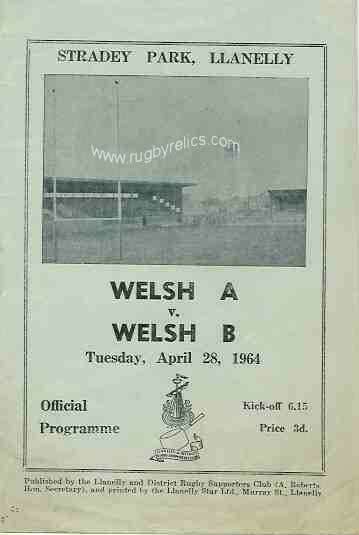 Although not a successful trip for the Dragons of Wales it became a watershed in the history of Welsh Rugby aand the sport itself. 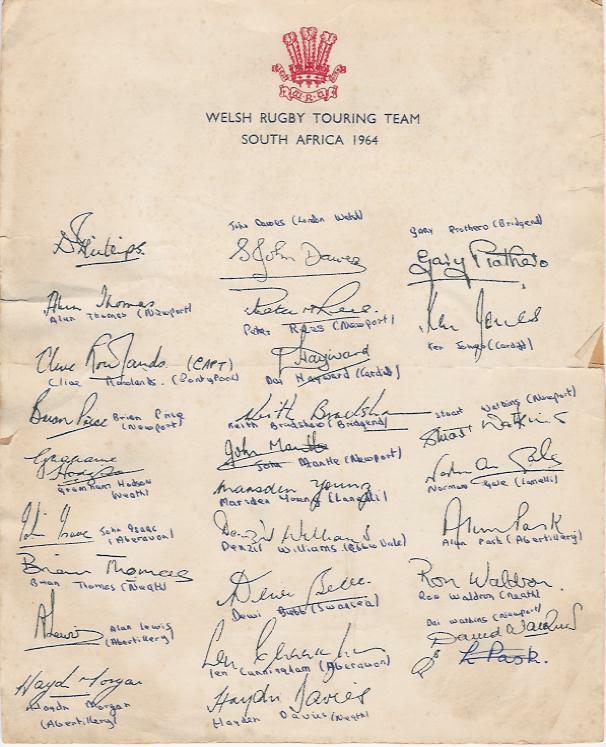 It was the failure of the team in this tour that sparked the Welsh Rugby Union into action. The next year they appointed the first ever National Coach and embarked on a trail of glory that culminated in the four consecutive Triple Crowns and two Grand Slams 1976 - 1979. 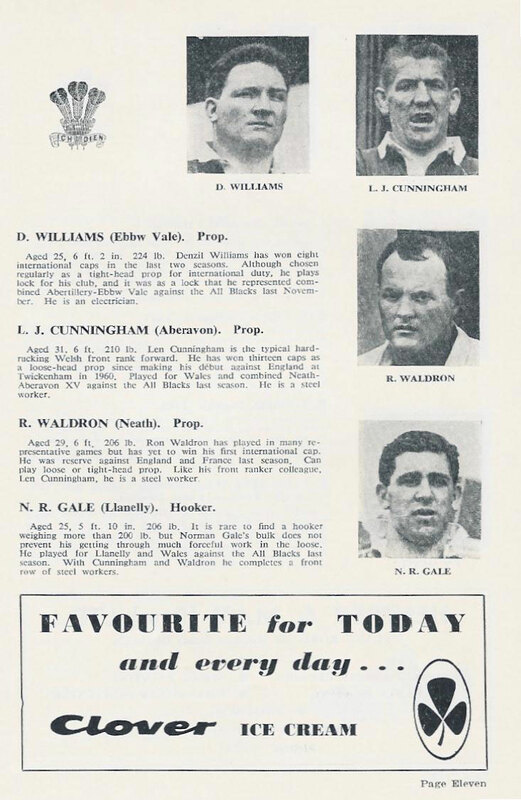 Prior to the tour three special matches were arranged, all played under the 'new laws'. Initially these were to pick the players for the tour and also to try out the the 'new laws'. We believe these three matches to have been played at Ebbw Vale on April 17th, Caerphilly April 24th and at Llanelli, date to confirmed. 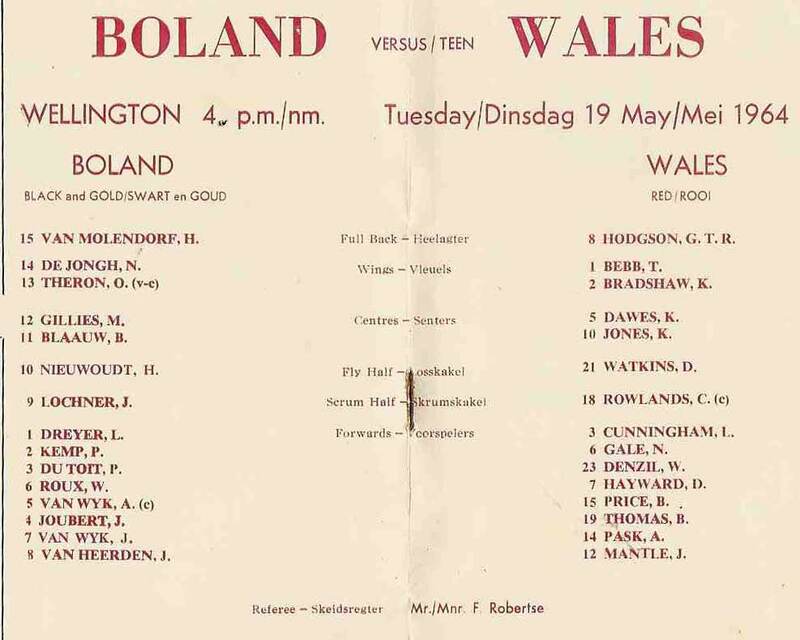 They took the format of Wales 'A' v Wales 'B' matches. Hopes were high of a first victory over the Springboks and the squad were travelling to South Africa with this as their main objective. 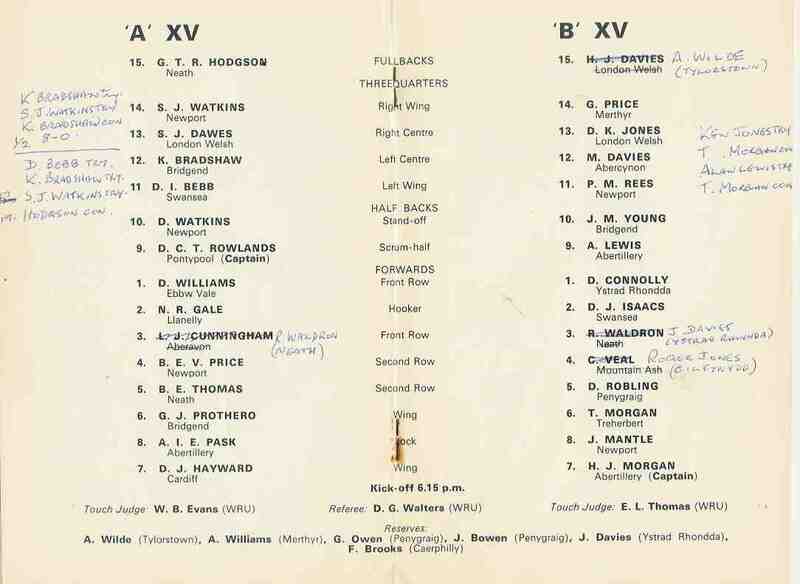 JBG Thomas writes in the programme for the pre-tour match at Caerphilly. 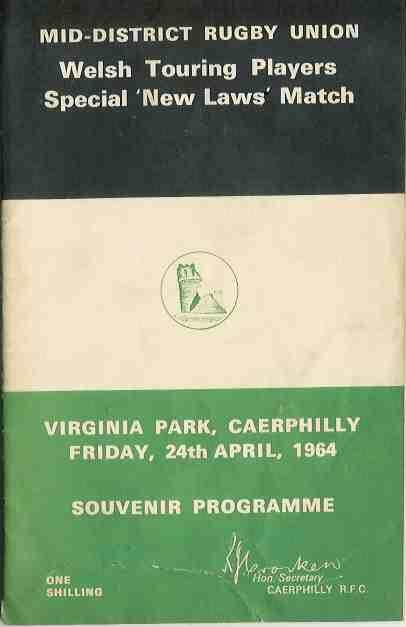 “The first tour by a Welsh team abroad is an important event and it is good that the sporting town of Caerphilly should play a small part in ensuring its success. 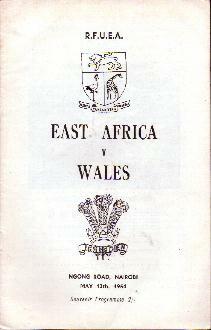 By staging a special "amended laws" match on behalf of the Mid-District Union, the Caerphilly Rugby Club is helping to ensure that the official party proceeds to East and South Africa , well acquainted with the new laws which should do much to revolutionise the game and see a return to more open play. All 24 players selected are in action today in the two sides, one representing the full Welsh side and the other containing the remaining nine players selected. This should be a match of considerable interest, for everyone in Wales who follows the game is keen to see the amended laws in action, and the nation wants the Welsh party to do well on tour. Overseas tours are the highlights of players' careers, and there is something special about the Welsh visit since it is the first made by Wales outside Europe and the last of a cycle of four made by the individual home countries in recent years. Scotland and Ireland have visited South Africa and England was in New Zealand and Australia last year. Not one of the three countries were able to win a test match, and thus Wales has a very real challenge when South Africa is met at Durban on May 23. The purpose of the tour to show the best form on the field and the best conduct off it, and there is no fear that Manager D, J. Phillips and his party will fail in their objective, but they do want to win the test match! All their efforts will be directed towards winning the test for Wales has never beaten South Africa and perhaps the fortunes of "war" will change on foreign soil. For the team it is a great adventure, as South Africa is a fascinating country, as mad about rugby football as Welshmen are, and renowned for hospitality to visitors. The tour is hard for there are four matches to be played, in two weeks against determined opposition following the week of preparation in Nairobi and Cape Town . It is not easy to forecast how the matches will go because on all tours, some players improve on their form at home, and some play below it. Yet this is not a long tour and many of the difficulties experienced by the British Lions will be absent. Fitness is essential and adaptation to new conditions even more important, and that is why the team's management are taking every precaution to see that the party is tuned both mentally and physically to the needs of the tour. The three special matches should acquaint the players with the amended laws and develop a spirit of combination. The tactical discussions will ensure that each player knows his part in the proceedings and the part to be played by every other player. 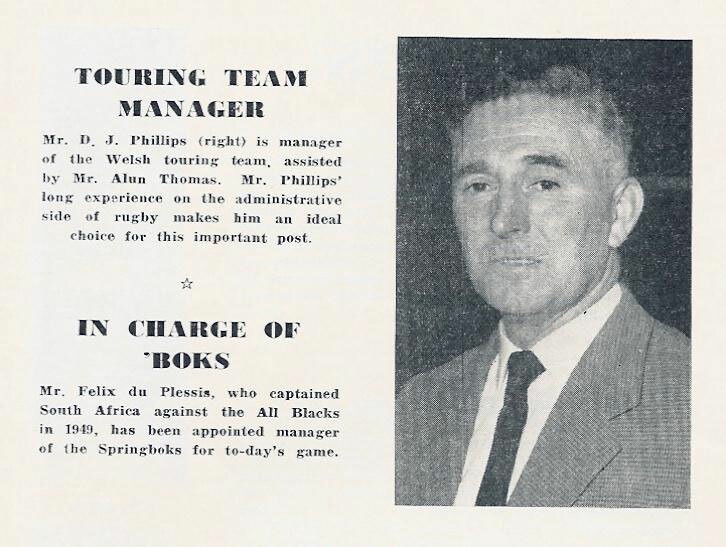 South African opposition will be strong, keen, swift and determined, and under their various coaches will have studied well the approach of Welshmen from films, articles and books, and will be guided by Springboks who have played in Wales in recent post-war tours. They appreciate that the Welsh spirit is good; that the knowledge of the game is good; that they want to win the test, and that they never give up until the final whistle. They have a healthy respect for Welsh rugby and remember the deeds of Alun Thomas, Hadyn Morgan, Alun Pask, Dewi Bebb and Ken Jones who have toured there with the Lions since the war. Again Dr. Danie Craven, one of the shrewdest students of the game, watched Wales in action against France , and returned home to tell his officials of the Welsh strength and weakness. They leave nothing to chance and this indicates quite clearly the nature of the opposition. The Welsh party have a pre-tour training programme that will prepare them for all eventualities and the party will not fail for the want of trying. There is a good team spirit among the players and if this is transmitted effectively into their play, they will enjoy a happy and successful tour. They leave London Airport on Sunday May 10, and fly out to Nairobi where they will be warmly greeted by the President of the East African Rugby Union and his colIeagues. They will reach there on Monday, and play East Africa on Tuesday, before flying down to Cape Town on Wednesday. 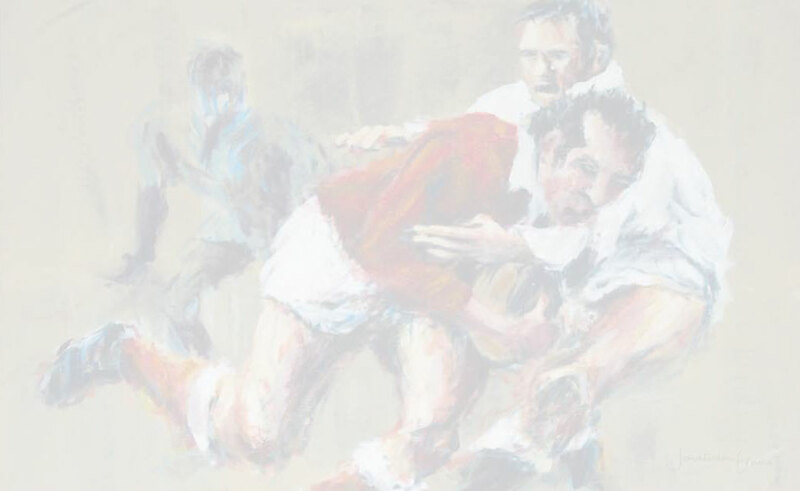 While there they will watch the Third and Final Jubilee match at Newlands on May 16, and then the three Jubilee players, David and Stuart Watkins and Alun Pask, will rejoin the team. The first match is against Boland which should provide a good workout for the vital test against South Africa on May 23. From Durban , a lovely city by the Indian Ocean , the team fly to Pretoria and play the Northern Transvaal which will provide really stern opposition. A win at Pretoria will be a worthy achievement. The crowd are as partisan as any town in Wales . The final match is at Bloemfontein , the city of flowers, in the centre of the Orange Free State , where the people are proud and independent and play good football. There will be an enthusiastic welcome, but the ground will be hard and dusty. 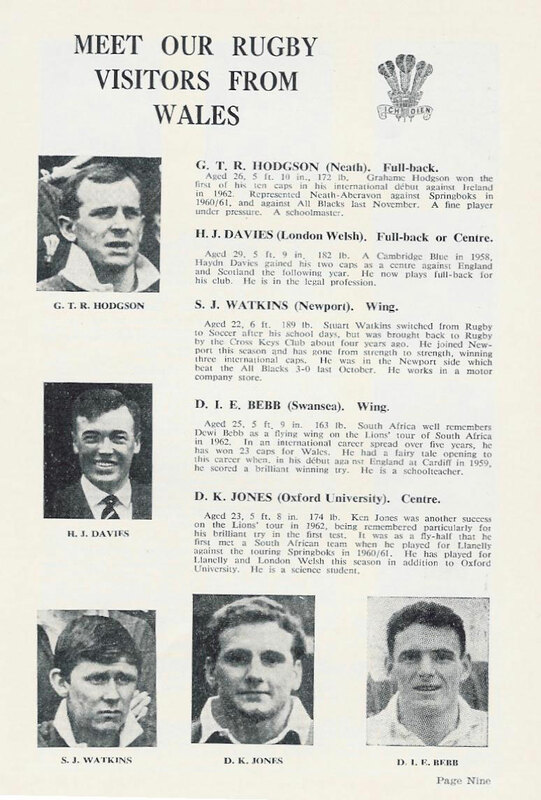 It was there incidentally that Clive Rowlands the Welsh captain broke his collar bone, playing at inside half for the Schoolboy Dragons in 1956. Trial at Ebbw Vale 17th April 'New Laws match' at Caerphilly 24th April The final 'new laws' match at Stradey Park, the 'B' team included 9 players from West Wales clubs, Felinfoel, Carmarthen, Gorseinon, New Dock Stars & Ystradgynlais. 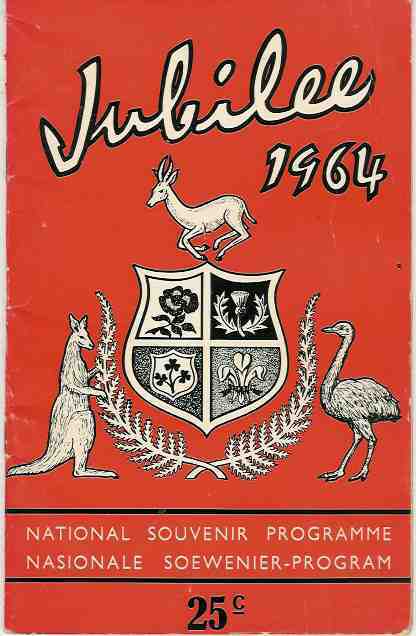 Illustrated above is the 'National Souvenir Programme' for sale on the day. The all purpose programme was available for most major matches in South Africa during this year. 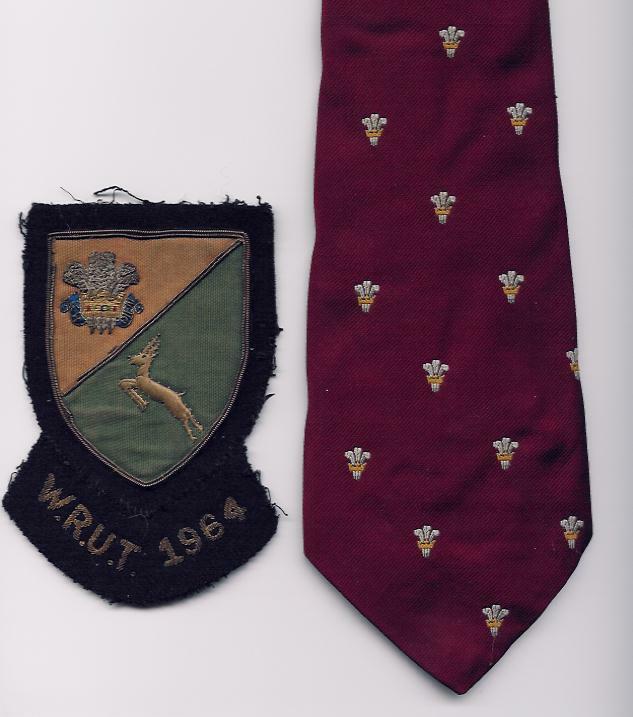 It was especially prevalent during the South African Jubilee matches celebrating the 75th Anniversary of SARFU. 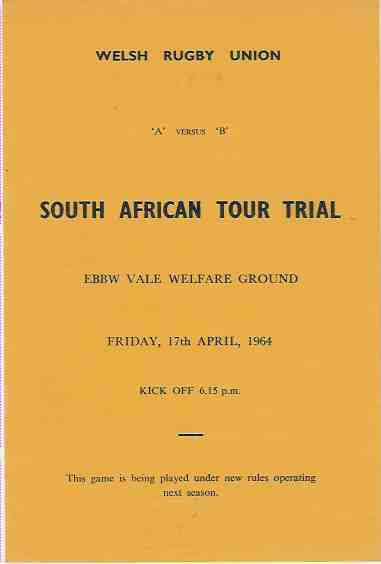 The centre pages including teams were the only difference at each individual match where this programme was available. The biggest Welsh defeat for 40 years. 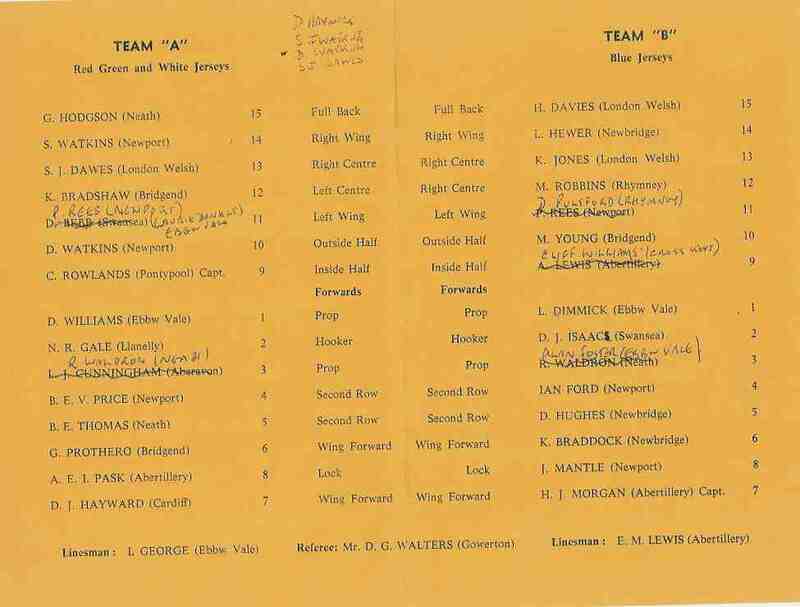 That was how Wales crashed in the heat at Durban on the first tour they undertook. The Springboks ran them off their feet in the last 20 minutes to register their sixth consecutive win over the Red Devils. Not since the 35-10 hammering from Scotland at Inverleith in 1924 had Wales been so routed. The only score Clive Rowlands and his men could manage was a Keith Bradshaw penalty goal. This goal kept Wales in the game with the score 3-3 at half time. But there was no escape after that. 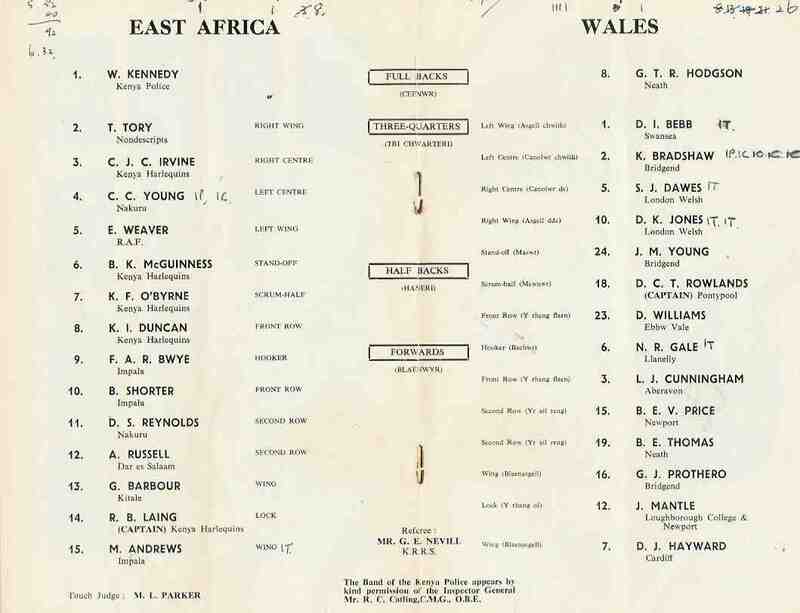 Wales's decision not to run with the ball was a mistake and, though Norman Gale stole six tight heads while conceding three, and Brian Price jumped well to win line-out possession, they could not match the home forwards' mobility and stamina. The pace wore down the Welsh pack and in one spell of eight minutes, South Africa snatched 13 points. Keith Oxlee kicked 12 points and in his 19 tests for the Springboks he aggregated 88 points. South Africa: L G Wilson; J P Engelbrecht, J L Gainsford, D A Stewart, C G Dirksen; K Oxlee, C M Smith; J. L. Myburgh, G F Malan (capt. 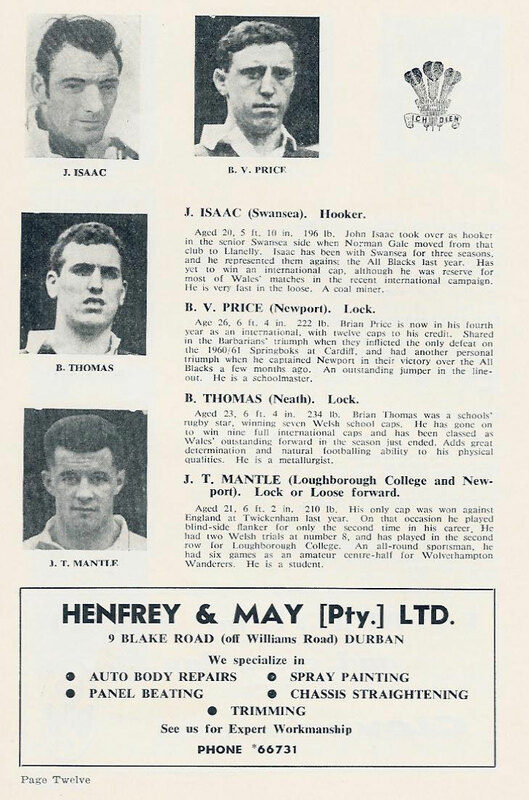 ), J F K Marais, G Carelse, A S Malan, T P Bedford, D J. Hopwood, F C H du Preez. 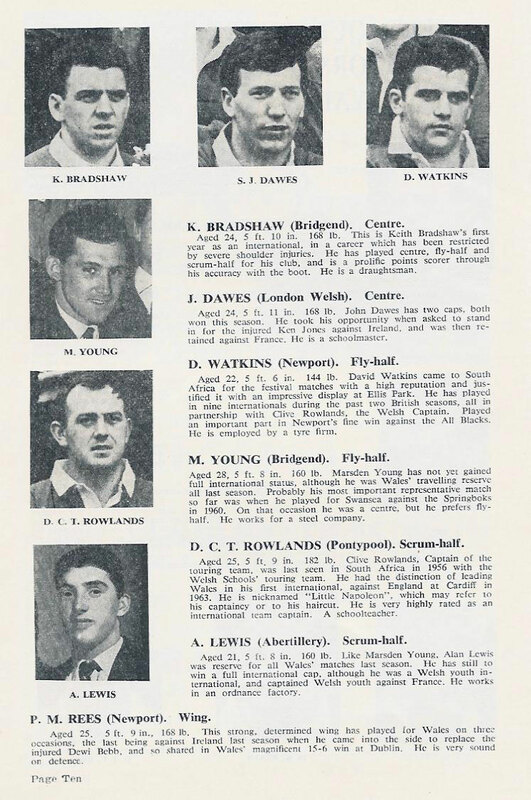 Wales: GT R Hodgson (Neath); D K Jones (L1anelli), S J Dawes (London Welsh), K Bradshaw (Bridgend,) D I Bebb (Swansea); David Watkins (Newport), D C T Rowlands (Pontypool, capt. 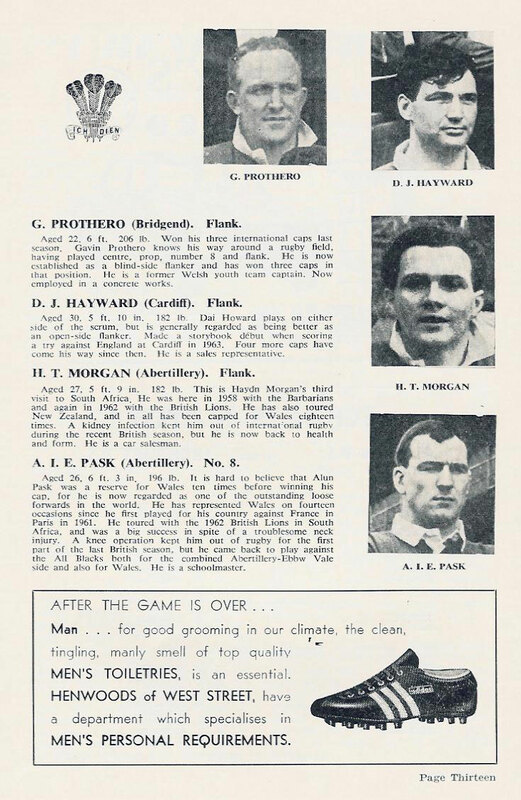 ); L J Cunningham (Aberavon), N R Gale (L1anelli), Denzil Williams (Ebbw Vale), Brian Price (Newport), Brian Thomas (Neath), A E I Pask (Abertillery), J T Mantle (Newport), David Hayward (Cardiff). For South Africa, Johannes Marais, Doug Hopwood and Nelie Smith scored tries. Keith Oxlee converted them and kicked two penalty goals. Lionel Wilson dropped a goal. For Wales, Keith Bradshaw kicked a penalty goal. Referee: Dr G K Engelbrecht (Transvaal). 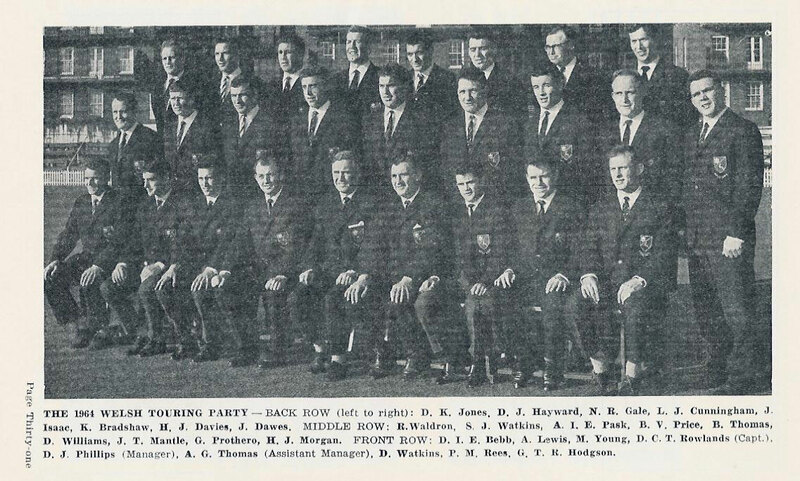 (text from John Billot - "History of Welsh International Rugby"